DGSHAPE Corporation, a wholly-owned subsidiary of ISA-UK member Roland DG Corporation and a leading provider of digital fabrication tools, including 3D milling machines, 3D printers, and engraving machines, announced today the launch of its latest decorating solution, the DE-3 desktop engraver. 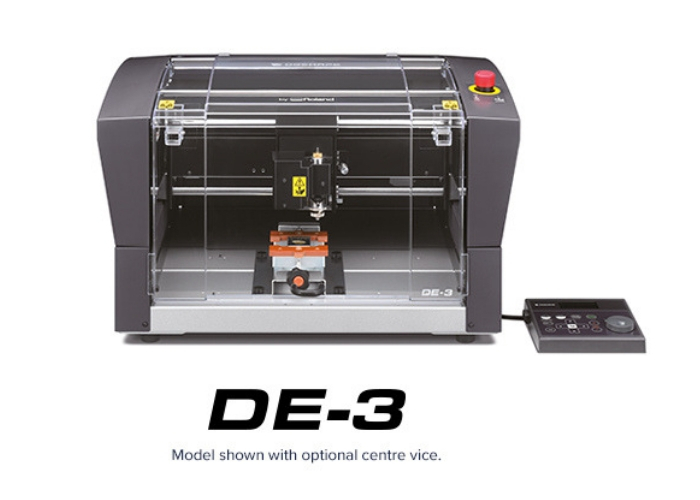 Compact yet powerful, the DE-3 offers simple set up and operation to precisely engrave a huge range of delicate and durable materials such as metals, engraving laminates and plastics, wood items and more. Ideal for use within workshop, office, classroom, and retail environments, the DE-3delivers an impressive variety of engraving applications including industrial nameplates and labels, durable and tactile signage, awards and gift personalisation. In today’s multi-billion Euro global market for personalised goods, modern consumers demand and expect unique products, customised on-demand for them. The DE-3 enables businesses to capitalise on this key trend as an intuitive and intelligent engraving solution. Safe and robust for retailers to use in-store and portable and quiet enough for home-based businesses to offer online unique gifts and awards. For industrial labelling and product marking applications, the DE-3’s variable data engravingtechnology makes it simple to personalise nameplates, tools and other industrial applications. For increased production flexibility in any environment, with Ethernet connectivity the DE-3 can be connected via USB or LAN. Other key enhancements includeupdated nosecone technology for higher quality engraving on uneven material, data buffer for offline engraving, and new bundled software: Dr. Engrave Plus. With advanced features such as AI and EPS file support, levelling and drilling functions, and variable data engraving, Dr. Engrave Plus is a design software that can create new artwork or take existing files from popular design software packages to output to the DE-3 for a true out-of-the-box solution.